Creating an incident free workplace combined with the best practice processes, methods and systems to become the contractor of choice in the markets in which we operate. Providing a workplace with a culture and attitude to take on any challenge. Fostering a network of relationships between Goodline's most important people (our clients and our employees) to drive growth, innovation and market leading service delivery. Goodline's staff and management exert a significant focus on being advocates of Goodline's core values - this is why the values are referred to at Goodline as HI FOCUS. 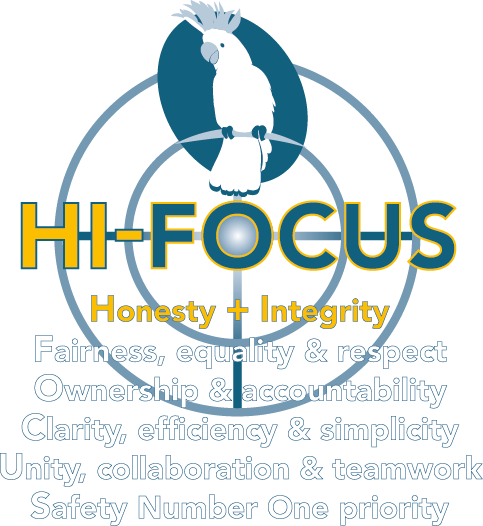 Focus on these values continues to deliver superior results in client satisfaction, staff engagement, safety performance and innovation. These values are further explained in Goodline's Code of Conduct, called The Goodline Way.